"DiEM25's Manifesto is a bold effort to reverse the damage and restore the promise,” says Chomsky. Noam Chomsky. Flickr/Andrew Rusk. Some rights reserved.CAMBRIDGE, MASSACHUSETTS, March 14, 2016– Distinguished American linguist, philosopher and political activist, Noam Chomsky, has officially endorsed DiEM25, the Democracy in Europe Movement launched last month by Greece’s former Finance Minister, Yanis Varoufakis. “Europe and the United States are responsible for some of the greatest gifts to, but also some of the worst crimes against, humanity,” said Varoufakis. “Together,” he elaborated, “Europeans and Americans (both North and South), we have given the world humanist rationalism, Bills of Rights, the idea of shared prosperity, internationalism, the anti-slavery movement, the United Nations, the list goes on. Yanis Varoufakis and Noam Chomsky will appear together at New York’s Public Library LIVE stage on Tuesday, April 26. Born in Philadelphia on December 7, 1928, Chomsky is regarded as the father of modern linguistics. He has authored over 100 books on topics in his field and on issues of dissent and US foreign policy. Chomsky is currently Institute Professor Emeritus at the Massachusetts Institute of Technology (MIT). 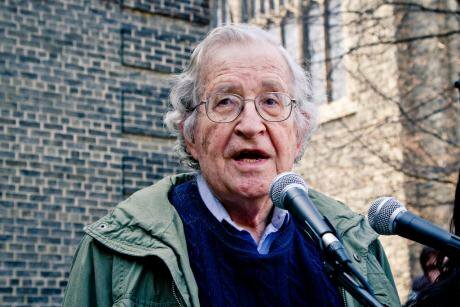 Noam Chomsky joins a growing list of intellectuals and global personalities’ endorsing DiEM25. Julian Assange, Ken Loach, James K. Galbraith, Saskia Sassen, Walter Baier and Brian Eno are among the more than 17,000 members who have joined DiEM25 since the movement’s foundation last February 9 in Berlin. See more from openDemocracy's coverage of DiEM25 here.